Alexis moved from Billings, MT to Santa Barbara in the fall of 2010 to attend Westmont College. While there, she developed a passion for health and fitness and working with other people. After graduating in the spring of 2014 with a degree in Kinesiology, Alexis became a Certified Strength and Conditioning Specialist through the NSCA. In the fall of 2015 she began teaching Physical Education classes at Westmont College. She loves cultivating relationships with her students and helping them navigate life as a college student through health and fitness training. 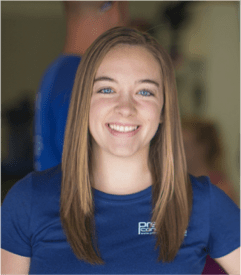 Alexis loves coming alongside her clients to join them in their health, fitness, and life goals. Whether in group classes or private training sessions, Alexis strives to educate people how to move well and live better, give them confidence in themselves, and encourage them to work hard and become their best self.